The short journey to Warrington awaits on a Friday, as your unbeaten Saints travel to Warrington, as our wannabe rivals get their first crack at The Entertainers in 2018. Jon Wilkin misses the trip after suffering a concussion on Friday evening, with Matty Lees set to take his place in the squad. Mike Critchley in the St Helens Star reports that Lees and and Louie McCarthy Scarsbrook are likely to deputise for Wilkin in his absence. Another big call for Justin Holbrook is whether to recall Ryan Morgan to the side. the centre suffered concussion in the Round 1 clash v Castleford, and with the side on a winning run, Holbrook has chosen to go with what’s working over the recent weeks. With Saints defence likely to be given a stiffer test, it remains to be seen whether Morgan is restored at the expense of Grace or Swift, though gut feeling suggests we’ll continue to go with the flow. For Warrington, changes will have to be made after Dec Patton received a five game suspension after facing the disciplinary panel on Tuesday. Sitaleki Akauola will also miss the contest after being handed a one match ban for Grade B dangerous contact in the same game. Elsewhere on the same day, young full back Jack Johnson suffered a devastating season ending injury during training, fracturing his tibia and fibula. Kevin Brown is in line to replace Patton after missing last week with concussion, whilst Bryson Goodwin returns from injury also. Two wins from their opening five fixtures hasn’t been the greatest of start for Warrington, though one of those wins did come against a jet lagged Wigan. 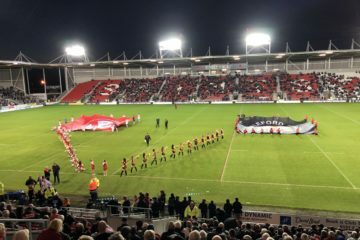 Warrington will look towards a 40-18 win against Saints last season at the Halliwell Jones as the yardstick, but with the boys in the Redvee displaying a far more ruthless streak it could prove to be a lot harder task. 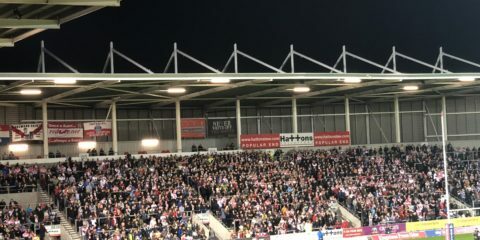 Saints began a run of games in March that see Leeds, Hull KR and Wigan to follow, by which we should be able to see how well our title credentials stack up. With Saints defence averaging 8 points a game conceded, we expect a slightly tougher inspection in this one, but still fully expect a victory. Saints: 1. Jonny Lomax, 2. Tommy Makinson, 3. Ryan Morgan, 4. Mark Percival, 5. Adam Swift, 6. Theo Fages, 7. Matty Smith, 8. Alex Walmsley, 9. James Roby, 10. Kyle Amor, 11. Zeb Taia, 13. Louie McCarthy-Scarsbrook, 14. Luke Douglas, 16. Luke Thompson, 17. Dom Peyroux, 18. Danny Richardson, 19. Regan Grace, 20. Matty Lees, 23. Ben Barba. 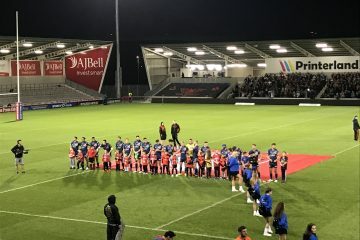 Warrington: Ryan Atkins, Kevin Brown, Mitch Brown, Daryl Clark, Mike Cooper, Dom Crosby, Bryson Goodwin, Chris Hill, Jack Hughes, George King, Toby King, Tom Lineham, Harvey Livett, Ben Murdoch-Masila, Joe Philbin, Stefan Ratchford, Tyrone Roberts, Morgan Smith, Ben Westwood.